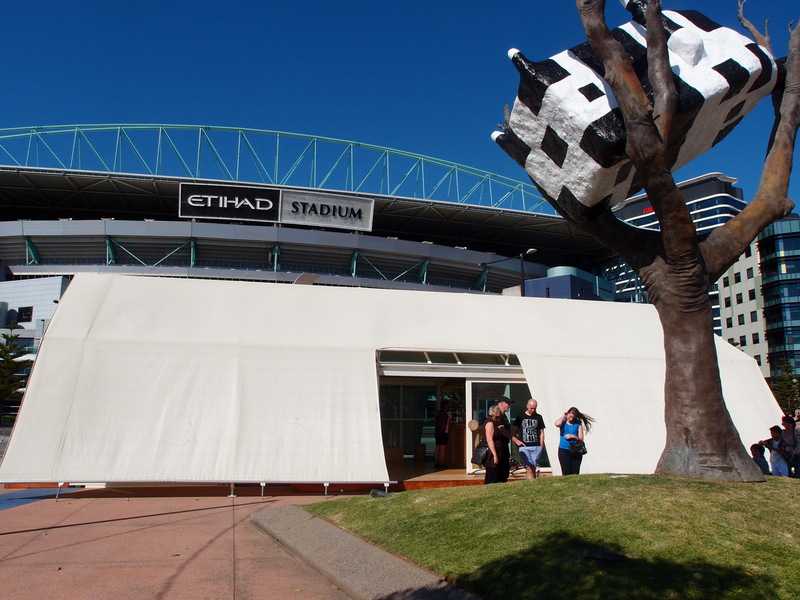 The drab and dreary Harbour Esplanade behind Etihad stadium has little more than the magnificent Cow up a tree to break the monotony of unfinished acres of glass-fronted businesses and empty high rise apartments with “waterfront views”. It is therefore fitting, that it is the perfect location for a glasshouse project. Local artist Lauren Berkowitz has joined forces with Seven Seeds to produce a beautiful 18-month long coffee and plant terrarium, directly under the cow. 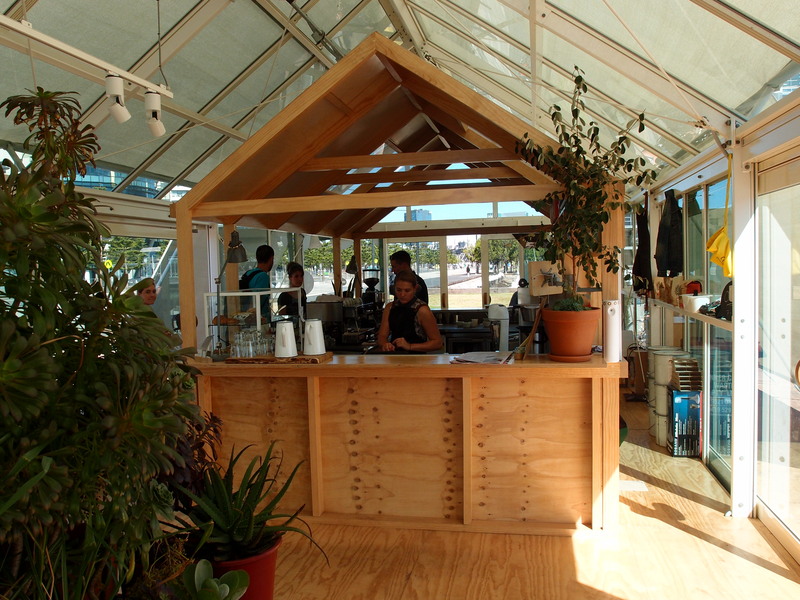 The tranquil, prism like structure is an oasis, a tropical forest of pot plants, succulents, eatable plants and native plants collated together in the middle of a toy house made of fine pine, shade cloth and glass. Inside, the ambiance is light and airy; on a windy day, I can imagine feeling like Dorothy just as she was lifted off into the air out of the Kansas atmosphere. The minimalist pinewood and white furniture creates a deliberate space of calm and quiet against the lush contrast of the plants that are haphazard and free range. With a short-term lease, this design is functional, classic and practical. Keeping the natural theme going, the coffee hub – a box within a box – has just the bare essentials. Seven Seeds continue to deliver their finest with house blends and the occasional single origin running through the machine and a batch brew (served hot or cold). 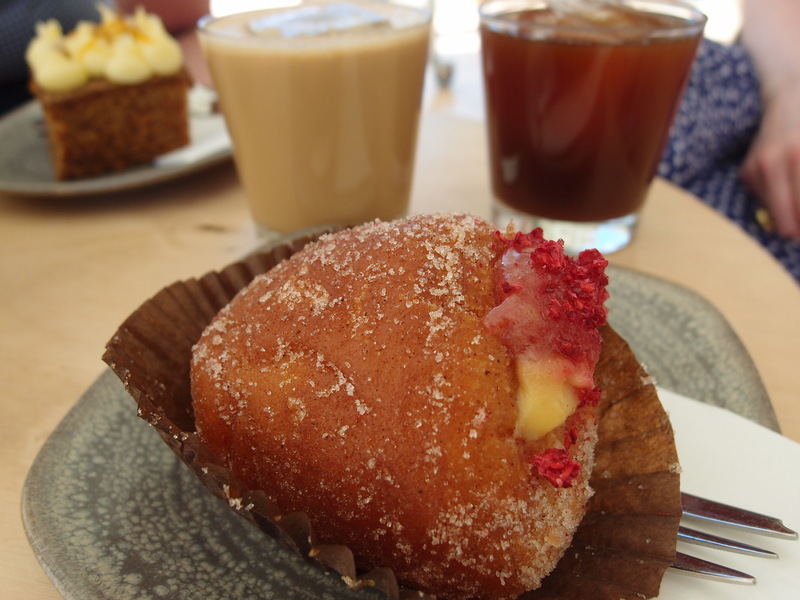 On the snacks front, small lunch sandwiches by Rustica and pasties by Matt Forbes keep our sweet tooth at bay. On an out of character Melbourne day, a whopping 28 degrees, saw many cold batch brews briefly make their way across our table. 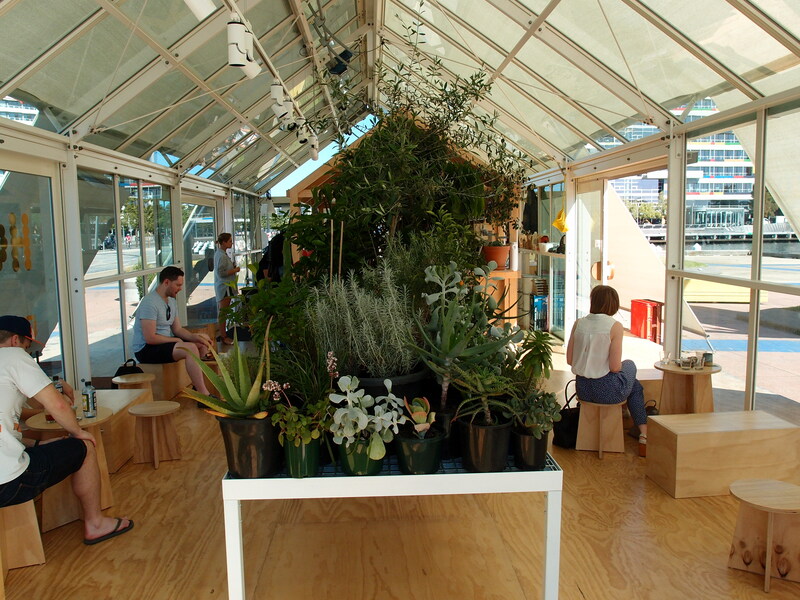 A saviour from the sun, with the cool breeze from the banks of the river swooping though the structure, Hortus is well worth making a trip down to the never-never docks this summer. Oh and for those left wondering, Hortus means, “enclosed garden” in Latin. Thanks to Bonnie King and Benjamin Johnston for being my photographers for the day.